IN the clothing section of the store, a Saturday and every parent was out pushing their children in carts through the aisles, the wooziness hit me. A mother was scolding her son, “put that down.” I reached for the wall, leaning against it for a second, and watched the little boy scowl up at his mother. He held a bright red scarf in one hand, the ends trailing down to his feet. Staring at the floor, it seemed to spin. I knew it wasn’t, but there are things you tell yourself without believing them fully. Maybe I shouldn’t have gone out. Maybe it was too soon. Too soon to be surrounded by so many people after so long with so few. “Are you…” It was the mother. She had walked up to me, her eyes wide. “Am I?” I asked. I righted myself, but kept my back to the wall so if I fell, it would be more of a slide. “That astronaut? You were on the news? Weren’t you on the, the, man, what was the mission called?” she asked. Her excitement palpable, even her scowling son looked up at me with round eyes. “Oh, boy, I knew it. Nicky wants to be an astronaut, don’t you?” she asked her son. “I do not!” Nicky said. His eyes narrowed at her. The scowl had returned. “I don’t like the dark,” he said. His eyes had met mine. The contact almost uncomfortable. The mission had been routine. That’s one of the first things I tried to stress to people. We didn’t know anything was wrong. It was only when we’d completed the mission itself, a routine rotation around a planet we’d been monitoring, and were returning home that things went awry. One of the astronauts, Gina Gomez, “Gigi” to everyone who knew her well, woke up to her shift. She went to the computer bay and began to dismantle it, systematically. Kevin Banks, my best friend, was the one who found her. He tried to stop her. “I got there too late,” I told the trauma specialist we were required to see upon our return. I didn’t say how Kevin’s blood had spattered across Gigi, how she looked like an abstract painting. Or how I’d frozen, only for a second, and forgotten everything training had taught me. It was a single moment but it seemed to stretch out and collapse, so I thought I’d be stuck in that second of time forever. Trina Davis, our medic, got there next and I’d never be able to forget the sound of her gasp, an intake of air so sharp that it sounded like a howl, right before she ran forward and slammed an anesthetic filled needle into Gigi. “Thank you, ma’am. Nice to meet you Nicky,” I said. He gave me a suspicious look, maybe no one had ever said that. After they’d walked away, I exhaled hard. The nausea had lessened, but some of the wooziness remained. The store no longer spun, but it turned slightly. I managed to make it back home, curled into my own bed, and tried to sleep away the feeling. The ringing vidphone woke me up. “Answer,” I said. “Yeah, yeah. I was sleeping.” I sat up in bed so I’d be in the screen’s cam-view. I tried to smooth down my hair. “It’s three in the afternoon…” Trina looked good. Better than I ever did. Her hair pulled back tight and makeup highlighting her overly large eyes. “Do I only call when I need something?” she asked. The night before everything went wrong, Gigi and I played cards. War, because only two of us were awake and it was the only game we both knew the rules to. “Our kind get along,” I replied. I flipped over a card. The queen of hearts. “He thinks that space shouldn’t be explored. He didn’t tell me that when we were dating and then he just lays it on me before the mission. Like he thinks we should leave some things untouched by humanity.” Her card was the ten of clubs. Gigi looked out the ship window behind me. I could see space reflected in the pools of her eyes. The darkness was infinite. She blinked and, for the smallest of seconds, I thought her eyes had become completely blackened in, like ink spilled across her irises. “Normalizing. Huh. I have to go into the Institute tomorrow, I’ll ask them what they mean by that,” I responded. “Why are you going in?” Trina asked. “Hard to be back to solidity?” she finished my sentence. “Hard to be back,” I agreed. I went to take a shower. The hot water would do me good. In the mirror, my reflection looked worse than I imagined — pale and puffy with sleep, my hair a tangled mass around my face, and my eyes were red-rimmed. I could have passed as a ghoul in a low-budget movie. Under the water, steam hovering around me, I thought of Kevin. We’d been at the Academy together. Trained alongside one another, been best friends, and then we got called for the same mission. He’d had two older brothers, parents who made Sunday dinners. His mother called me “Avy,” and I always had an open invitation to come over. She made pasta with sauce so spicy that it would sting my lips for hours. Kevin mocked me for it: the amount of water I’d chug as we ate, and how then I’d always ask for seconds. “Piquins,” she told me once, “that’s the secret.” She showed me the tiny dried peppers, kept in a jar close to the stove, shook one out into the palm of my hand. The skin was papery and I absent-mindedly popped it into my mouth. The heat wasn’t as intense as I imagined. It was a pleasant burn until I bit into one of the seeds and then the heat flooded across my palate. She laughed, delighted at my foolishness. “What did she do?” I asked. We were laying in his backyard, staring up at the night sky. The stars shimmered and shook above us. A shooting star arced across the blue. We both went silent, watching its glow. “Did you make a wish?” I asked, after the light was gone. He nodded but never said what it was. Waiting at the Institute, I stared at a news screen on the wall. Stories from the day flashed by in blips: stock rises for Monroe Labs, storms cause blackouts across New York, memorial to open for the Goldilocks Eight. I looked away from the news. She nodded, curtly, and left. I took a seat across from Parva. “Off and on since we got back.” The truth was it had been happening longer than that. It had started on the return trip. Things had seemed further away or closer in the ship than they actually were. I’d reach for something and miss it by inches. If I stared out into space too long, I’d feel a blankness in my head, like my memories had drained out and a numbness spread up from my feet to my body. For a moment, I’d forget that I had limbs. They’d just be empty spaces. The worst was a morning when I couldn’t stand up to climb out of my bed. Your feet are there. They’re there. Move your foot, just move your foot, I’d kept telling myself, willing even a toe to move.. My body had refused. Right when I was about to panic, to scream for help, Kevin walked in. He watched me for a split second, a frown curving across his lips, and then he reached down and pulled me to my feet. Righted, I’d been suddenly returned to ability, to life. I didn’t ask him how he knew what to do. I nodded. My heart rate quickened. “You had the symptoms during the mission, didn’t you?” Parva’s gaze was focused on me so steadily that I knew what a mouse felt like in the split-second before the hawk’s talons encased it. “Yes, sir. I’m sorry I didn’t mention it sooner.” I studied everything but his face: the photo on his desk was of a smiling family, though he wasn’t pictured in it. “What?” I asked. His words filtered through my mind, spinning into place, until the meaning might become clear, a Rubik’s Cube of answers. I nodded. Outside the window, behind Parva, the sky was gray. Clouds had overtaken the sun, but no rain was supposed to fall. “Everyone felt like I did?” I wasn’t even sure that was my question. “You don’t know why she did it? Whether whatever… stimuli, did it? Made her do it?” My voice kept still, didn’t shake like I thought it would. “There were things she managed not to tell us, Ava. Some episodes when she was a child she kept from us. We only found them out once she got back. Her parents have been cooperative.” Parva’s voice was clipped, calm. He sounded like he was reading aloud a sad news story he didn’t really care about. Alex was tossing a ball up and down. It thwacked against the palm of his hand every time he caught it. He was a hard man to get to know, or to like. Handsome, with a deep voice, and a permanent frown etched on his face. He was a couple years older than Kevin and I, but he made it seem like decades stretched between us. “I am so tired of this mission,” he said. Possibly to me as he was turned slightly in my direction, though more likely he was addressing the air. “How can you be sick of being in outer space? Out-er… space,” Trina said. She had turned to study him. “Then you’d be dead,” Kevin muttered. “I just hit you with a ball.” Alex’s usual cool seemed startled slightly. “Oh,” she responded. “I was looking out. Space is so…” Her voice was almost monotonic. That was the last time we would all be alive in the same ship room together. At Kevin’s funeral, his mother had me sit with the family. His older brothers on either side of me. His casket was closed. I was glad. I didn’t want to see whatever the coroner had done to make him seem presentable, lifelike in death. I didn’t want to look down at his face and know the exact spot where’d they covered up where his skull had cracked, where his nose had been broken, where his lips had been split apart. A woman played a song on the violin. It was a tune I didn’t know: low and slow and sad. Focusing on my breathing, I kept from crying. Kevin’s mother’s shoulders shook, each of her breaths was a ragged gasp. I tried to think of peppers, of shooting stars, but stars led me to space, to waking in the dark and hearing Kevin’s yell. “Gigi! Stop, stop!” And then the sound of something heavy hitting something hard. A thud of his body falling to the ground. Then more hits. I could have gotten there faster, but for a second, I couldn’t remember I was alive. In bed, I couldn’t feel any part of my body. It was like I was a thought stuck in a loop, someone else’s memory. Her hand dropped back to her side and she turned from me, going to her two remaining sons who had been waiting patiently for her. I stared down at the ground, willing the world to become still. “I don’t know why we’re doing this,” Alex said. He sat on one side of me and Trina sat on the other. I crossed and uncrossed my legs, staring ahead at the wall. A painting of a forest hung on it. The colors were all slightly off, leaves blue-green and red-brown bark that wouldn’t exist in nature. “Do you think the artist was color-blind?” I asked. “Almreal?” Trina and I said at the same time. “Almost real, not quite, but not surreal. She was the rage in the art world a couple of years ago. Dumb.” Alex slouched deeper into his seat. We got up, like a cadre of sullen children about to follow a teacher to detention, and allowed Parva to lead us through a few halls. “What… what are we supposed to do?” Trina asked. “She said she wants to talk to you. So, listen, I suppose,” Parva responded. I stopped walking, so I could stand next to him. Trina paused. Her impulse to do whatever the Institute wanted perhaps overridden by seeing Alex display an emotion other than anger or boredom. “Gibberish? You said she was normalizing?” Trina sounded like a little girl who’d dropped an ice cream cone and been told she couldn’t get a new one. “You do have symptoms, then?” Parva’s voice was like ice. “I wake up and I think the room isn’t my room. Or my arms are so long, so long, I could just stretch them out and reach the other side of the ocean. It’s like nothing is truly me anymore. None of this belongs to me.” Trina’s voice shook. She bit her lip hard. I reached out and touched her shoulder. Her whole body was shaking. I could feel the tremors run up through my hand and into my own body. “So, maybe, you see the reason, now, why we need to know what Gomez experienced. How that might help us help you? Maybe her body just broke down quicker. Or maybe she had something underlying that caused her to disassociate.” Parva turned from us and continued walking, knowing we would follow. That we would have to follow. Gigi was in a small room, wearing a loose white hospital gown that kept slipping from her shoulder, and sitting on a cot. She didn’t look up when we entered the room. I glanced to Alex and Trina, who still shook though it had lessened, and knew that none of us wanted to speak first. “Ms. Gomez, your crew is here with you,” Parva said. “Gigi,” I said. I took a step towards her. The first time I’d met her, she’d been standing in front of a window. The sun illuminated her, made her glow. She’d smiled at me, reached a hand out to shake mine, saying how happy she was to be going on the mission with me. She reached out and touched my hand. Her skin was cool, dry. Holding my hand, she stared into my eyes. There was a blankness in my head, as if someone had tranquilized my brain, fuzzy, foggy. I needed to pull my hand away, but her grip was tight. “You should have asked what his wish was,” she said. Her voice flat, expressionless, and barely audible. “What?” I tried again to pull my hand away. “Let me go.” I didn’t realize I’d shouted it, until Alex was beside me, pulling me away from her. He kept his arms around me, our hearts both thudding fast in our chests. “You have to let it in. The stars feel so good when they’re inside you,” Gigi said. She looked back at the floor, her body sagging slightly, as if the effort had exhausted her. Parva motioned for us to leave the room. I looked over at Alex and Trina, they both looked relieved. I tried to mirror their expressions back to them, but something pulled itself out of my memory. They were willing themselves to believe that Gigi was different from us, that she had something predisposing her to whatever she had become. It was always Gigi and me up in the long shifts, when everyone else slept. I don’t know how it came down that way. We’d play cards, or swap stories back and forth. Gigi told funny stories well — perfect pauses for emphasis, a facility with mimicking people’s voices. I usually did anything I could to avoid staring too long into the black openness of space, something about it made me feel unmoored if I looked too long, a feeling similar to contemplating certain kinds of mathematics like invisible numbers. Gigi, on the other hand, spent so much time staring outwards. I’d catch her, transfixed, at the windows. I wondered what she saw out in the darkness. What feeling filled her head. “Wanna hear a secret?” she asked. “Sure.” I shuffled a deck of cards, whish, whish went the paper against itself. “When I was a kid, my parents were always fighting. They’d scream at each other. It was awful, just awful,” her voice low. “Not forever?” I asked. My voice sounded small, young, like a child upset when the fairy tale doesn’t end with happily ever after. That night, after returning from the Institute, I lay down in my back yard. The grass cold beneath my skin. I could feel a tingling building beneath my skin — like an inside-out shiver. Stretching out my arms, I wondered how far they might reach, if I was growing longer or if it was just my shadow I felt. I watched the night sky. Fireflies flew in and out of my vision, blinking out call-and-responses to potential lovers. I thought of Kevin, under six feet of dirt, so far away from the sky. Above me, a shooting star made a flash of white across the dark blue. I wished I’d never lived amongst the stars. 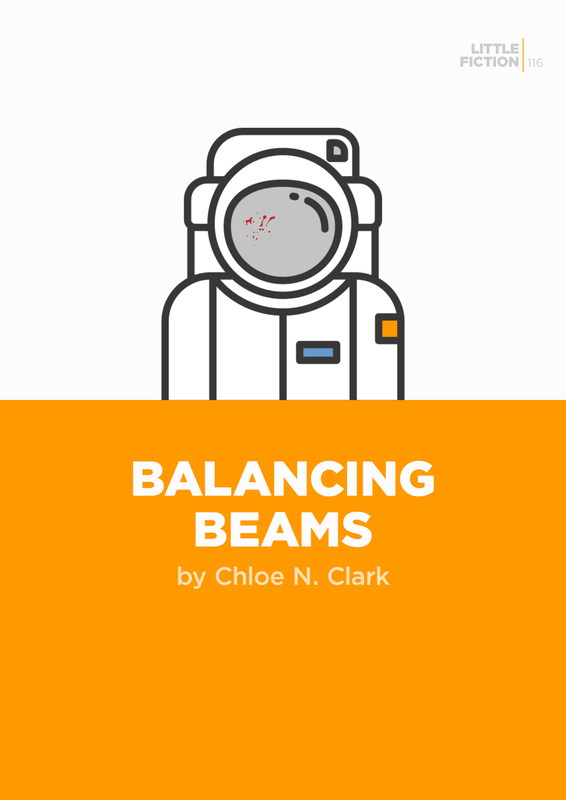 Chloe N. Clark’s work appears in Apex, Cosmonauts Avenue, Flash Fiction Online, Uncanny, and more. She is co-EIC of Cotton Xenomorph, writes for Nerds of a Feather, and teaches composition, communication, and creative writing at Iowa State University. Her debut chapboook, The Science of Unvanishing Objects, is out now. Find her on Twitter @PintsNCupcakes. LF #116 © 2018 Chloe N. Clark. Published by Little Fiction | Big Truths, February 2018. Edited by Beth Gilstrap. Cover design by Troy Palmer, using images from The Noun Project (credits: Giuditta Valentina Gentile).